No matter the situation you find yourself in, the Velo Champion Multifunction Bike Tool has everything you will ever need to assist you get going again. It is a well-designed and compact tool that combines high quality materials with premium qualities that can only be gotten on products twice its price. If riding trails is your thing, then this tool is a much needed tool for you. Keep it very safe and make sure your riding pals don’t try to steal it. The tool is Ideal for both road or leisure cyclists and mountain bikers. It is compatible with all major equipment including Campagnolo, SRAM and Shimano and comes with a canvas carry pouch for safe keeping. Amazing multi tool with 18 functions including Torque T-25, chain splitting tool, etc. Compatible with the 3 most used spoke wrench sizes. 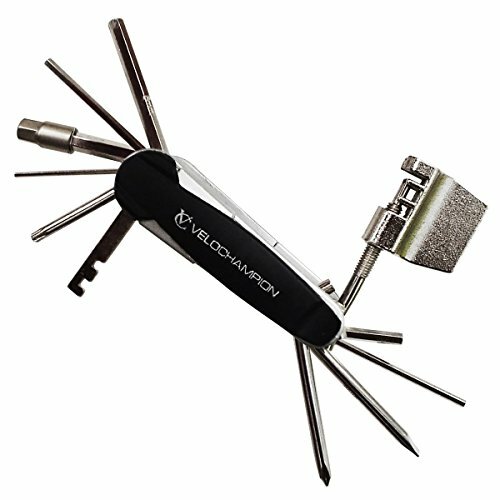 The Velo Champion Multifunction Bike Tooldoes an excellent job at an affordable price. It comes with every tool that needed to disassemble and reassemble an entire bike. Study build while not being difficult to switch the tools in and out. It is made of very tough construction and trim design without overloading the tools. The functions are numerous and the tire levers on the chain tool assists in maintaining balance while setting a link in the chain. The chain-tool is a great important addition to this tool. The tools are perfectly chosen and include a fitted carry case/pouch made of nylon. You might note that he casting on the chain breaker is a bit coarse, but the material is sleek and tough for the rest. The screwdrivers have been made nice and sharp around the edges which help to prevent distorting a screw head. The tool comes handy and the price is great. We rate this product as quite impeccable and very durable. It is compact enough to stow in a saddle bag. The tool come with marked sizes for easy identification and does not have any burrs or sharp uneven edges. Every tool folds and unfolds nicely as they should. This tool is recommended to anybody who has a strong passion for working with bikes.